Commissioning a sculpture is an easy and enjoyable experience at the end of which you own an object of beauty that will bring you pleasure and enjoyment for life. This guide is intended to assist you in what may seem at first a daunting proposition. If you already know what you are looking for, just email or telephone us on the link in the contact tab at the top of this page or in the footer areas below for a no obligation discussion on your requirements. We welcome enquiries for bespoke sculpture from the Public, Commercial and Private Sectors. We have experience and expertise in all these fields. 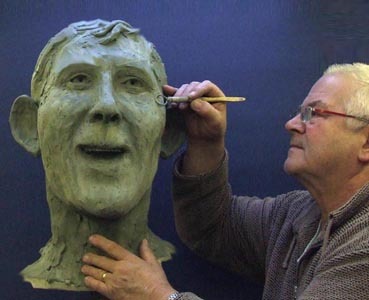 To find out more about commissioning a sculpture, see the "Where to Begin" section below. You must already like the idea of owning a sculpture otherwise you would not be here. During the past 25 years, we have just about created sculptures of everything you can imagine. 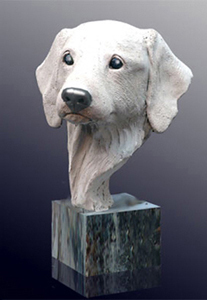 Including of course, special people in our lives, family pet sculptures, horse sculpture, house sculpture, boats, the list of sculptural project goes on. Just about anything you can name, we can design and create it for you with accuracy and lifelike realism. We offer a complete service from design, through creation of original 3-D artwork, mould making and reproduction in several mediums. 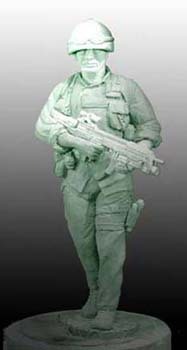 Hot Cast Bronze is the the ultimate material in which to create a sculpture. Often the budget precludes this and fortunately there are many modern alternatives including resin bronze, cold cast marble, porcelain and a multitude of alternatives. wherever practical, a personal visit to the subject of the commission is desirable. This would involve taking sketches, photographs and reference dimensions in order to complete an accurate sculpture. However this is frequently not possible owing to the international nature of enquiries or as is very often the case, the person or animal to be sculpted is no longer with us or the sculpture is to be a surprise. In such cases we need as much photographic information as possible together with some idea of dimensions or actual measurements if available. We can supply helpful guide sheets to facilitate this. This applies equally to people, animals, places or things. Cost of Work: You might want a one off sculpture for your personal enjoyment or you might have a commercial project where you intend to reproduce the item in quantity. Either way, we we are happy to work with you, to develop your ideas into reality. These prices are meant for guidance only and do not include the cost of casting, which in the case of hot cast bronze can double the price but a resin casting will add very little. Smaller and more simple subjects can cost a lot less whilst complex subjects, for example, military figurines can cost a lot more. The only way to really find out is to get in touch. We are happy to provide a no-obligation quotation for specific enquiries. Please see our contact page or email on the link below. Larger projects would require stage payments and agreement to an "Artists Contract". However, for peace of mind satisfaction is guaranteed even further, over and above a 25% deposit payable at the start of any commission, you will not be asked to pay any more unless you are 100% satisfied at the completion of each stage. Stage 2. (45% payment) due on completion of the original to your full satisfaction, prior to moulding. Stage 3 (30% plus despatch costs) is on completion of moulding and first casting. Approval is usually on the basis of jpegs by email but you would also be welcome to visit our studios at any mutually agreeable time.